On December 26, 2018, KVN on oncology on the topic "Lung Cancer" was organized by teachers of the department "Clinical Disciplines 2" G. A. Matkasymova, A. A. Gaipova. The competition involved 3 teams “The Sixplatins”, “The Phoenix”, and “The Celestians”. The competition (KVN) included the following 3 stages: greeting (5 points 1), black box (questions 5 points), presentation of the theme in drama (10 points), best workshop (5 points). The jury consisted of: MD, associate professor, head. Kaf M. Bugubayeva M., teachers: O. Omurzakov, G. Osmonova, J. A. Abzhamilova, phD Saed Ali Rakhat Abbas, J. M. Eralieva preparedness for all stages. 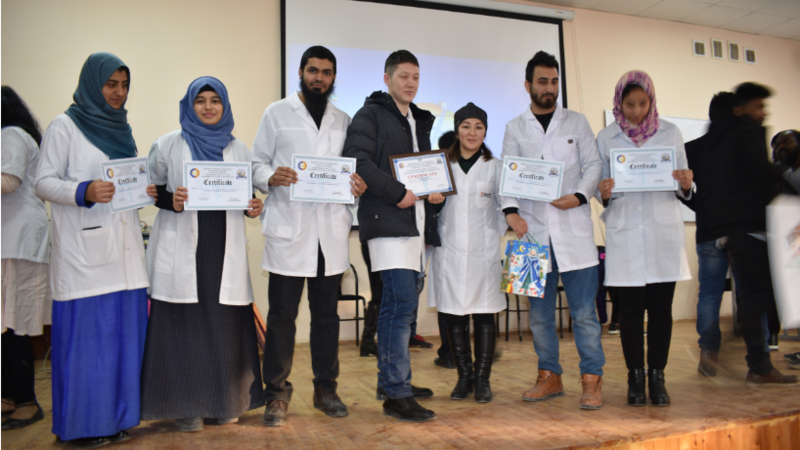 Particularly vividly, interestingly and with acting skills, students of the 5th course revealed the topic “Lung cancer” in the drama at the 3rd stage. Also, students showed high ingenuity in the workshop competition, creating creative handmade, including all the features of the development of this pathology. At the end of the competition, the jury summed up the points, and determined the points received by the 3rd stage of each team. By the sum of points 2, the teams “The Sixplatins”, “Phoenix” scored the same results (106 points) and took the first place. The team "The Celestians" received 100 points and took second place. Teachers Omurzakova A. E., Matkasymova G. A., and Gaipova A. A., who were in the jury, congratulated the winners and noted active students among these teams. Team members were awarded certificates and exempted from modules. The students were satisfied with their performance and their desires to further participate in such contests and thanked the teachers for organizing.